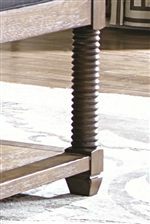 This server will be a lifesaver if your dining area. Four gorgeous leather doors encase two adjustable wood shelves and one tray drawer. 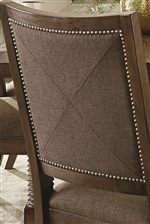 Store extra silverware, plates, or linens and always have them close by. There's an open component storage shelf at the top of this unit, with two fixed partitions. 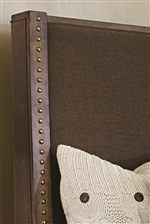 This server also features nailhead trim and brings an air of sophistication to your dining space. 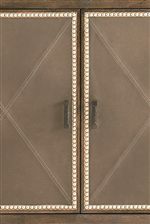 The Compass Server with 4 Leather Doors and 2 Adjustable Wood Shelves and 1 Tray Drawer by Bassett at AHFA in the area. Product availability may vary. Contact us for the most current availability on this product.